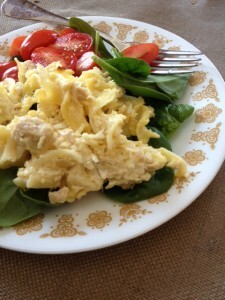 Serve the kugel with a healthy green salad. It’s a truly delicious collection of recipes that blend tradition with innovative ingredients. Take, for example, the recipe for Etrog Cake on page 75. Have you ever cooked with an etrog? Have you even heard of an etrog? If you went to Hebrew school, as I did, you know that the citrus fruit is associated with the Sukkot holiday (but I’ve never known anyone to cook with it). This recipe, like so many in the book, is adaptable, and such adaptations are noted on the page. Keep kosher? There are instructions to make the dairy dessert into one that’s pareve. Can’t track down any etrogs? Just substitute lemons. What’s my interpretation for the “new Jewish table?” Our traditional Jewish table – influenced by my Ashkenazic/Eastern European heritage – seems to be transforming. Intermarriage plays a huge part in this, as my husband of 8 years, Luis, is from Puerto Rico. We’re raising our children Jewish and incorporating traditional Puerto Rican dishes into everyday and holiday meals. Big Mama Tillie’s brisket is likely to be served with a side of traditional black beans and perhaps flan for dessert. Maybe it’s also the way we learn about cooking through social media and other technology that changes the way we cook. While I always prefer a written recipe – in, say, a book or one of my grandma’s recipe cards – the internet has expanded the way that I cook. In part, my work writing and photographing for the Jewish Food Experience, and learning about Sephardic dishes and ingredients has influenced it as well. After photographing these Moroccan charoset balls last year, I made my own and served them at Passover – much to my Ashkenazic guests’ delight. But, like most Jewish mothers out there, I digress. Back to the book. 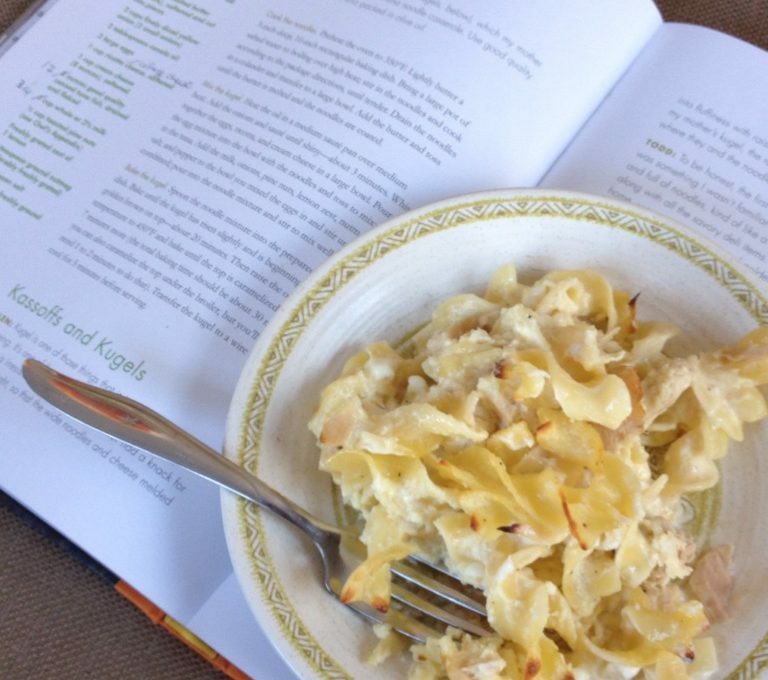 I’ve learned over the past couple of years that if I call it “kugel,” my toddler will devour it. 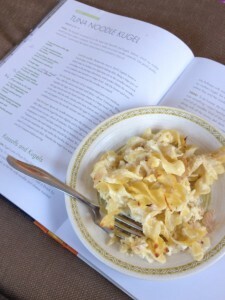 So I modified the dairy recipe for Tuna Noodle Kugel on pages 158 and 159 in the “spring” section of the seasonal cookbook. Here’s my version. And yes, my toddler devoured it. Boil water and cook noodles. Preheat oven to 350 degrees Fahrenheit. Dice onions and cook in a little bit of canola oil over medium heat for a few minutes to brown them. Drain noodles and put in greased 9x13” baking dish with butter. Toss to melt butter and coat noodles. In a separate bowl, mix the eggs, cottage cheese, Neufchatel cheese and sour cream. Add in tuna fish, and use a fork to break it into pieces. Put cheese mixture into baking pan with noodles and stir to incorporate. Add lemon juice or zest, milk and salt. Sprinkle with pepper, to taste. Stir everything together. Bake for 20-25 minutes at 350 and then broil for a couple of minutes more to brown the top of the kugel. Next time I think I’ll boil frozen peas with the egg noodles or perhaps mix in chopped artichoke hearts before baking. To make it kosher for Passover – it’s coming soon! April 14! – use Pesadic egg noodles. This book would be a lovely hostess gift the next time you’re invited out for Passover, Rosh Hashanah, Hannukah, whatever the occasion. There are sample menus for holidays, cooking techniques and so much more in this innovative Jewish cookbook from the Grays. DISCLAIMER: I received a free copy of The New Jewish Table from the publisher. In no way did this influence my review. All opinions expressed are my own. Like my grandma, Big Mama Tillie, I make notes on recipes in my cookbooks. It’s my favorite thing about the recipe books she’s handed down to me.